Abstract: This paper will explore the Energy for ME program, funded by the Environmental Protection Agency and the National Science Foundation, which worked across formal and informal K-12 environments to bridge the gap between society, science, and the environment. Specifically, this article documents how Energy for ME integrates three experiential education pedagogies (place-based education, inquiry, and project-based learning) in combination with real-world electricity data in order to impact energy consumption within participating communities. Energy for ME schools and communities have saved over $135,000 in homeowner electricity costs, 900,000 lbs of carbon, and 1,000,000 kWh of energy) in electricity costs over the 3 years of the project. The environmental challenges that our youth will be faced with in their adulthood are extremely complex. Today’s learners, both young and old, are constantly barraged with crisis after crisis. Economic, environmental, and social issues become intermingled, and learners of all ages can feel powerless in making an impact on the global problems and challenges they face. The environmental crises we face are too big, the issues too complex, and the solutions seem very far out of reach, so why should anyone bother? These are the hurdles today’s educators must overcome to inspire stewardship, understanding, and creative solutions. Authors like Stapp, Wals and Stankorb (1996), Hart (1997), and Jensen and Schnack ( 1997) argue that societies require citizens who can independently analyze problems, make pro-environmental choices – even when doing so challenges social norms, and work collaboratively to find solutions. Therefore effective education should cultivate autonomous decision-making as well as collective problem solving(Chawla & Derr, 2012). Our children need to become ‘resilient learners’(Claxton, 2003). But how can we integrate these experiential education approaches to develop environmentally literate and responsible citizens into the American education system? This paper will explore one model program of the Island Institute, the Energy for ME program, that works across formal and informal K-12 environments to bridge the gap between society, science, and the environment. Specifically, this article documents how Energy for ME integrates three experiential education pedagogies (place-based education, inquiry, and project-based learning) in combination with real-world electricity data, used to impact energy consumption within participating communities. 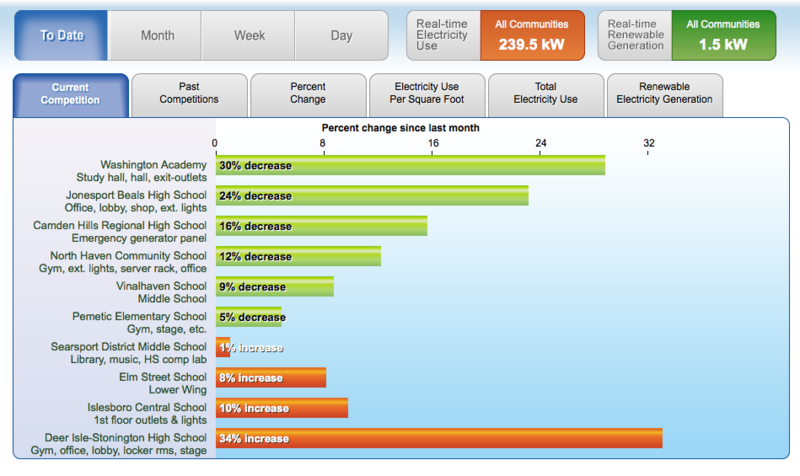 Energy for ME schools have saved over $50,000 in electricity costs in the past year alone, and savings continue to grow. This paper will also discuss how the lessons learned from the Energy for ME project might be applicable for others hoping to work with schools and community members to reduce energy costs and use in their own communities. The Island Institute is a non-profit organization based in Midcoast Maine with a mission that is committed to both the ecological and cultural sustainability of Maine’s 15 year-round island communities and surrounding rural coastal regions. These communities are geographically isolated and do not have the access to resources, specifically educational and economic opportunities, that other regions take for granted. The island and rural coastal communities along the coast of Maine are supported by natural resource-based occupations, primarily fishing. Lobster fishing alone accounts for up to 70% of the local jobs in these areas, highlighting a real vulnerability and need for additional opportunities to diversify the local economy. In addition, seven of Maine’s island communities pay from three to seven times the national average for electricity due to their reliance on either costly submarine cables or polluting diesel generators. The state pays some of the highest electric rates in the nation. The national average for electricity costs is $0.10 kWh. Islanders pay up to $0.70 kWh. Mainers have the highest dependency on home heating oil in the entire nation, using this costly and polluting fossil fuel to heat the some of the oldest housing stock in the country. With 30 years of experience in serving the island and coastal communities of Maine the Island Institute has seen first hand the challenges and innovative solutions communities can develop. For example, the islands of North Haven and Vinalhaven were paying some of the highest electricity rates in the country in 2007. As rates showed no signs of decreasing, but rather, increasing steadily, the entire community came together and voted to erect three wind turbines to provide the majority of power for the islands. Residents saw a 15% reduction in their electricity rates when the turbines went online in 2009. Modern societal issues are amplified in island communities, where environmental and economic challenges can literally determine the survival of the community, and the islands’ finite boundaries and resources make them microcosms for our world. This setting provided an ideal setting to implement an energy education program since energy played such an important in the everyday life of these communities. In conversations with island and mainland teachers, parents, and school administrators it became very clear that community leaders were looking for creative solutions to address their most critical community sustainability issues, and teachers wanted to provide a venue for the future leaders of the community to engage in the process. This convergence of a strong community need, enthusiastic teachers and school leadership, and a history of successful partnerships for education led to the birth of the Energy for ME project. When Energy for ME was implemented in 2010 it brought together 3 island schools and 7 mainland coastal schools from throughout Maine. Students in grades 6-12 – and their families – learned how to better understand their communities’ energy-consumption habits, as well as how to develop effective strategies to increase energy efficiency and decrease energy consumption. Energy for ME was designed to create public awareness and action on these issues by engaging students, an approach highlighted by the National Science Board’s 2009 Building a Sustainable Energy Future report (National Science Board, 2009). By incorporating inquiry- and place- based pedagogies, it focused on the steps individuals and communities can take to make informed decisions on issues of energy consumption, fossil fuel dependence and climate impacts by looking closely at energy efficiency practices and renewable energy generation. For students, this meant understanding the underlying environmental and social issues, studying potential solutions, and implementing meaningful change that can start right in their own homes. The Energy for ME project is grounded in an innovative framework that brings together the power of 1) place-based education; 2) non-hierarchal learning communities, and 3) applied use of technology. Place based education (PBE) promotes interdisciplinary learning that is rooted in the local community to accomplish tasks in both academic- and civic- engagement goals, while at the same time providing learners with the experiences and confidence to believe that they can influence positive change in their communities (Gruenewald & Smith, 2008; Smith, 2002; Sobel, 2005). Learners engage most actively in topics that are framed with a high level of personal relevance and authenticity . PBE approaches provide rich fodder for creating learning environments that present core curricular topics through a locally-framed lens, leading to high levels of ownership and engagement (Chawla & Cushing, 2007; Conover, Kermish-Allen, & Snyder, 2014; Hart, 1997). To accomplish the civic and academic goals of place-based education there is a great deal of skill development, specifically around problem solving, communication, and collaboration, while at the same time generating outcomes in self-efficacy for learners that are needed to influence long-term civic engagement (Sobel, 2005). At the model’s core are the assumptions that: 1) schools and young people are among our most important community resources; 2) successful education projects must build local connections with traditional core curricula standards; and 3) all project results must answer questions that are relevant to that community (Kermish-Allen et al., 2009). Place-based education will keep students engaged in projects that they see will make a difference, but how do we attract them and bring them to the table to discuss issues of importance to their community? Energy for ME built upon their love and facility with technology. Today’s students have a thirst for connectivity, a passion for their place, and unparalleled digital media fluency. They are entirely in their element when allowed to utilize technology resources to facilitate their learning (Fadel & Lemke, 2006). The potential for technology-based educational innovations to harness this faculty and curiosity is huge. Eleven to fourteen-year-olds spend an average of 8 and 2/3 hours a day engaged with media, including technology-mediated social interactions such as mobile phone calls, texting, online social networking, and the creation of personal websites and blogs (Rideout, 2010) These staggering statistics can be viewed in an extremely negative light, or we can see it as an opportunity for innovation, growth, and engagement for our students. If students are given the tools and freedom to use their expertise with technology, rather than reprimanded for experimenting with its capabilities, there is a rich potential to achieve enhanced learning opportunities(Fetaji & Fetaji, 2008; Goodison, 20010000; Zurita & Nussbaum, 2004). In many classrooms teachers have empowered students with technology tools that extend their educational experience past the walls of their classroom, into their lives outside of school, and into the global arena, allowing them to interact and learn with their peers across the nation and the world. To use technology successfully in the classroom, teachers must feel comfortable seeing it as a tool in their toolbox – not an add-on, but an effective means for fostering inquiry-based learning, seamlessly integrated into the curriculum. Paired with strong non-hierarchal learning format projects like Energy for ME, teachers can encourage students to take a technology leadership role in the classroom, while teachers guide the learning process by framing inquiry-based questions. The incorporation of locally relevant data and technology can vastly increase student engagement in data analysis, and build their ability to reason scientifically, as well as increase their “ownership stake” in the findings (Reid-Griffin & Carter, 2004). In addition, partnerships between schools, communities, and industry can effectively bolster student engagement and achievement, while also improving community social and economic vitality (Powers, 2004). With this in mind, the specific technology Energy for ME employed was high-resolution electricity monitoring – the eMonitor a product of Powerhouse Dynamics. The eMonitor provided the ability to track minute-by-minute data for each circuit or subpanel in a building. The electricity data was updated every minute, providing nearly real-time feedback. 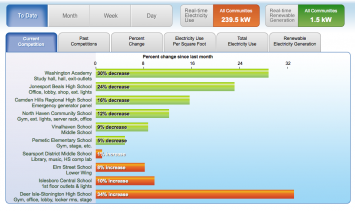 Middle and high school students especially responded to real-time data due to the “instant gratification” that they experienced when an action they performed influenced energy use and cost on the dashboard. With eMonitors installed in each school, a few homes, and a publicly-used building in each of the 10 participating community, students and their teachers and parents gain a very detailed understanding of how buildings in their community use electricity as well as a powerful way to develop data literacy skills. The eMontior also had a password protected online dashboard that gave students, teachers, and community members the ability to view electricity usage data and trends for all buildings across all participating communities in the project. The images here show what sorts of data and imaging are available from the eMonitors. Image 1 shows minute-by-minute the electricity consumption history for October 15, 2012 at the Jonesport-Beals High school and the history of that use. 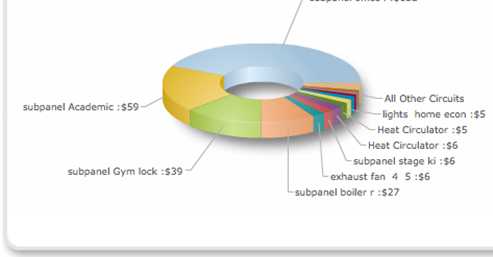 Image 2 shows the circuit-by-circuit usage patterns and highlights the top consumers, which was a very powerful tool for school maintenance staff and administration to identify areas of potential cost savings. Although at the same time, school-level installation was not an easy task, but through the process the project team worked very closely with the facility managers of each participating school. Facility managers hold the “keys to the school” and have therefore been integral to the project. One of the lessons we learned at the start of the project is that a positive relationship with facility managers can make energy efficiency investigations far more productive and longer lasting, and we have carefully fostered their engagement in the project. We offered facility manager trainings on how to work productively with students and teachers, and free access to professional development opportunities such as Building Operators Certification (BOC) classes and annual conferences. Energy for ME recognized energy efficiency as a high priority and attainable energy strategy that should be tapped immediately. The development of locally-harvested renewable energy is also a key element in reducing our society’s ecological impact and contributions to climate change, and was encouraged by the program as a next step beyond efficiency projects. In our experience, however, an educated community of stakeholders is key to finding equitable solutions to our environmental problems. And there are no more committed advocates for change, from an individual level to a national scale, than the local ratepayers and stakeholders who have researched and analyzed the benefits and challenges of sustainable energy generation and use. Energy competitions have been an integral component of Energy for ME, using the excitement and challenge of competition to amplify awareness of how actions influence electricity usage. Seven competitions have taken place over the three years of the program – and resulted in cumulative savings of over 60,000 kWh; $9,000; 55,000 lbs of CO2 , the equivalent of planting nearly 30 trees. Our staff has learned from and the challenges and successes, ultimately developing a model for month-long energy competitions that increase in complexity throughout the school year. Real-time competitions are made possible by the sophisticated eMonitor technology installed in schools, homes and community buildings. Working closely with Intellergy software developers, our team created a competition dashboard that hosted the competitions, separate pages for each school community, including competition archives and eBank transactions. Schools earned eBucks by finishing competitions with a percent reduction. Schools kept track of the eBucks they accumulated in their eBanks, and they redeemed eBucks to fund small energy efficiency initiatives in their schools and communities. For example, students at North Haven Community School earned $946 eBucks in the 2012-2013 subpanel competitions, and used about half of that to purchase power strips and LED task lighting for their school. The site can be reached through Energy for ME’s homepage: http://www.islandinstitute.org/energyforme/. Scaffolding the competitions: Beginning with the second year of the program, we utilized the high-resolution ability of the eMonitor to focus the competition on a single subpanel of the students’ choosing in each school. E4ME staff provided council to schools in selection of their subpanel. We found that students felt more empowered to make changes when the area was limited to a wing or area of the school. After two successful subpanel competitions in fall and winter of year two, we finished the year with a whole-school competition. In year three, we took it a step further. In the fall’s Subpanel Showdown, students focused again on one subpanel. The winter Olympic Energy Challenge moved up to the whole-school level. For the third and final competition of the year, and the final competition of the program, we asked students to work with their chosen community building, and share the strategies they had learned to save energy in their schools. This proved to be a difficult reach for most schools, though in several instances students planned and gave presentations to staff and boards of their community building about the eMonitor, competition and program. Post Competition: reflect on how the competition went, what could have been different, why were the results what they were? What should the school do with any eBucks earned? Summer Institutes and Classroom Implementations: The Energy for ME curriculum was taught at Summer Institutes (which included teams of students and teachers) and offered as a resource to teachers as needed. Curriculum areas included lighting, heating and renewables as well as ethnographic data analysis and student leadership. To view the full curriculum suite please visit the Energy for ME teacher resources page at http://www.islandinstitute.org/energyforme/teacher-resources/. Energy toolkits were also provided to classrooms, allowing students to use tools used by energy professionals. The toolkits included HOBO data loggers, infared light meters, flicker checkers, and a light meter. The summer institutes consist of a combination of student leadership training, curriculum development, team building, and six major content themes of: 1) appliances and electricity load; 2) heating and cooling systems; 3) lighting; 4) transportation; 5) renewable energy; and 6) public relations and communication. All of these core content areas revolve around the use of inquiry methods to study energy consumption and are aligned with state science standards. Students then integrate the data, such as electricity usage data, ethnographic data, and/or geo-spatial data, to tell the story of how electricity is used in the building. Once teams of students and teacher completed a summer institute they were tasked with implementing a local energy investigation in their community. Most teams completed investigations at their school, but others reached out to home owners or community buildings to gather data, analyze the data, and determine recommendations for decreased energy consumption. Elm Street Elementary School provides a perfect example of what Energy for ME looks like in a classroom. In November 2012, students from the Elm Street School researched the lighting in the school and prepared a presentation to the School Board with help from Energy for ME project staff. They had surveyed parents and community members about their support for energy efficiency projects, used a light meter to measure light levels in the gym, and worked with a local electrician to evaluate costs, potential savings, and payback of a lighting retrofit. Armed with this data, the students made their case before the school board and won unanimous approval for upgrading the gym lights. The school will be saving around $1,500 per year after the upgrade, with a payback period of less than 3 years. 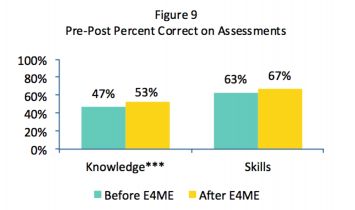 Learning outcomes for students were tracked over the 3 years of the project focusing on data literacy, STEM career interest, STEM content gain related to energy literacy and standards, and environmental stewardship and awareness outcomes. For the purposes of this publication, we will focus on the latter three – knowledge gain related to energy literacy and standards, environmental stewardship, and environmental awareness outcomes. The summer institute professional development model consistently yielded very favorable results in knowledge gain for both teachers and students. there were no differences in learning gains based on (a) participants that attended 2 or more summer institutes versus new summer institute participants, (b) middle versus high school students, or (c) students and teachers. The latter results, in particular, support the success of the project’s non-hierarchical learning model. 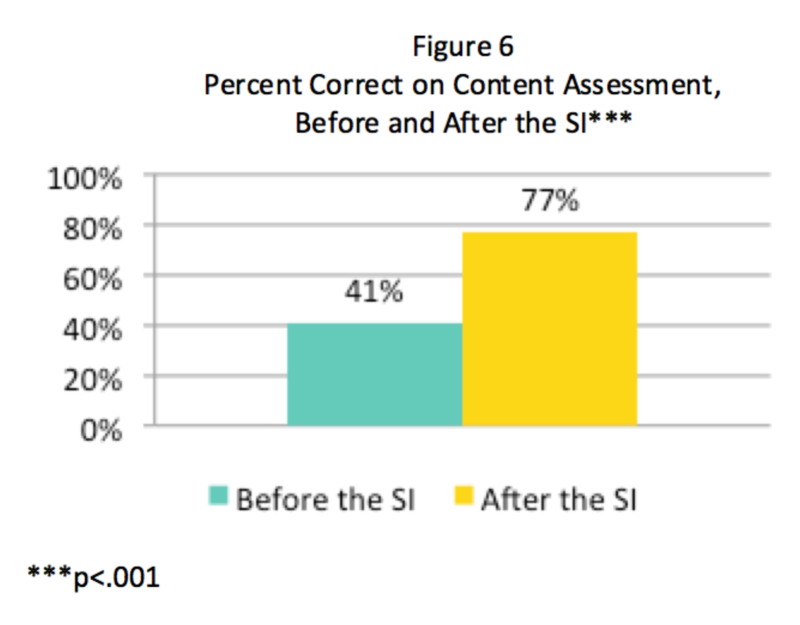 Classroom implementation during the school year yielded statistically significant gains in learning outcomes, especially in Year 2 of the project, which was the most active. 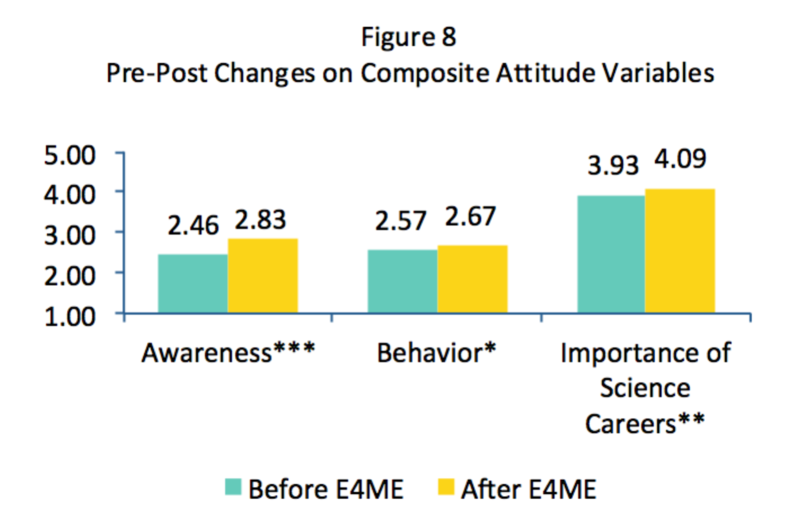 As seen in figures 5 and 6 below, significant changes were seen in relation to four of the five outcomes: awareness, behavior, career attitudes, and knowledge. 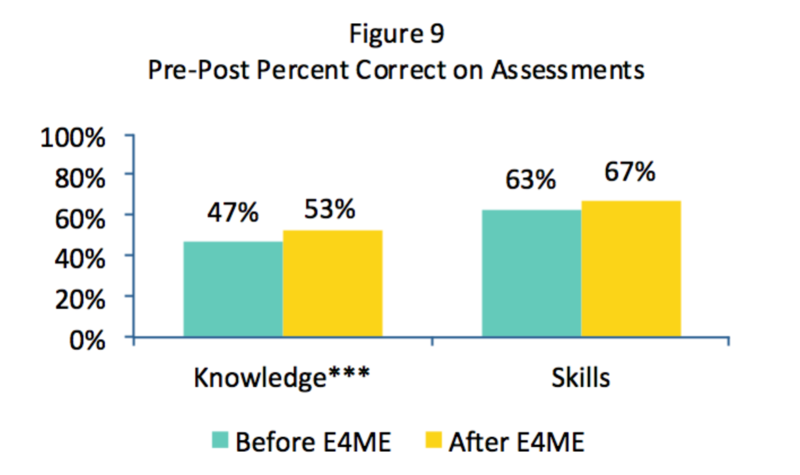 Regression analyses indicated that increased participation in classroom-level program components predicted post scores in all domains, and that the number of out-of-school E4ME activities often predicted gains above and beyond the classroom level. (t(148)= -4.70, p< .001) as seen in figure 6. Pre-post analyses were then conducted on composite scores related to each domain. For example, a composite score was created by averaging students’ responses to five awareness items that documented awareness of electricity use in homes, school and community, and the impact of electricity consumption on the state and global climate. 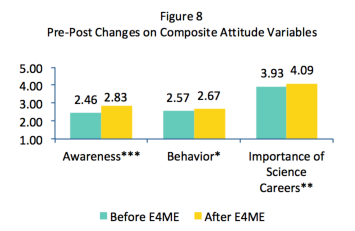 As seen in figure 5, a paired-samples t test indicated that participants reported statistically significant gains in awareness after participating in Energy for ME (t(203)= -5.839, p< .001. The behavioral items asked participants how often they exhibited energy-saving behaviors (e.g., turning off electricity when not in use, bicycling or walking and using power strips) on a four-point scale. A paired-samples t test indicated that participants reported statistically significant increases in these behaviors after participating in Energy for ME (t(197)= -2.61, p< .05). The outcomes in knowledge gain, environmental awareness, and environmental behavior are certainly positive and speak to the power of community-based energy education projects. Initiatives like this project that support community-based energy solutions, whether it is increased efficiency, renewable technologies or a combination of both, must start at the local level and be verified through a process of data collection and evaluation of suitability through community outreach and education. It is clear to see that the inclusion of local data that relates directly back to student experience is extremely powerful not just for creating change in communities, but also for inspiring powerful learning experiences in a formal classroom setting. Providing communities with the opportunity to gather much of the community energy usage data needed to begin the process of understanding and evaluating their own consumption, can lead to significant changes in behavior that could impact a community’s energy future. The combination of high resolution energy monitoring, summer institutes for student and teacher teams, curriculum / activity guides to jump start projects back at school, and ongoing energy competitions provided ongoing supports to participating schools that built upon each other throughout the three years of the project. While much of this was made possible by generous grants from the National Science Foundation and Environmental Protection agency, there are many components of this project that others could incorporate into their own communities. For example, many energy utilities now offer smart metering for homes and commercial buildings which provides access to thier daily electrical consumption data to rate payers. Building off of the evolution of these new technologies, and many other energy efficiency apps, provides the opportunity to utilize the Energy for ME model in any classroom interested in investigating their community’s energy consumption habits and determine if there are recommendations they could make to make that consumption for efficient and sustainable. Through projects like Energy for ME and many others explored in this volume, tomorrow’s citizens are gaining the experience, confidence, and skills needed to become ‘resilient learners’ and create the change they want to see in the world. Projects like Energy for ME empower students to take a leadership role in developing and implementing home-grown, sustainable strategies that will lower energy costs in communities that face some of the nation’s highest energy costs and greatest vulnerability to the impacts of fossil-fuel use. As a result, they are helping build a more energy and climate conscious citizenry and contribute to the long-term viability of their own communities..
Chawla, L., & Derr, V. (2012). The Development of Conservation Behaviors in Childhood and Youth. In The Oxford Handbook of Environmental and Conservation Psychology. Oxford University Press. Claxton, G. (2003). Building Learning Power: Helping Young People Become Better Learners. TLO, Limited. Fadel, C., & Lemke, C. (2006). Technology in schools: What the research says. Fetaji, M., & Fetaji, B. (2008). Universities go mobile – Case study experiement in using mobile devices. Information Technology Interfaces, 30th Annual Confernece on IEEE. Goodison, T. (2001). The Implementation of E-learning in UK Higher Education. World Conference on Educational Multimedia, Hypermedia and Telecommunications 2001, 2001(1), 613–618. Gruenewald, D. A., & Smith, G. A. (2008). Place-based education in the global age: local diversity. New York: Lawrence Erlbaum Associates. Hart, R. A. (1997). Children’s Participation: The Theory and Practice of Involving Young Citizens in Community Development and Environmental Care. Routledge. Powers, Amy. (2004). An Evaluation of Four Place-Based Education Programs, 35(4), 17–32. Rideout, V. J., Foehr, U. G., Roberts, D. F., & Henry J. Kaiser Family Foundation. (2010). Generation M[superscript 2]: Media in the Lives of 8- to 18-Year-Olds. Henry J. Kaiser Family Foundation. Senge, P. M. (2000). Schools That Learn: A Fifth Discipline Fieldbook for Educators, Parents, and Everyone Who Cares Abou [Paperback]. Crown Business. Smith, G. A. (2002). Place-Based Education: Learning To Be Where We Are. Phi Delta Kappan, 83(8), 584–94. Stapp, W. (1996). Environmental Education for Empowerment: Action Research and Community Problem Solving (illustrated edition.). Kendall/Hunt Publishing Company. Thank you, I have recently been looking for info about this topic for a while and yours is the best I have came upon so far. But, what about the conclusion? Are you certain about the source?